Baby back ribs are some of the most tender, juiciest type of ribs you can smoke. I will eat a good rack of beef ribs any day, but nothing gets in my way when I know there is a rack of slow smoked, sweet and spicy baby back ribs on the pit. Baby backs cook faster than regular pork ribs, so if you only have a few hours, smoke a couple racks of these ribs to save time. You can add brown sugar on the ribs before you put them on the smoker to give them an even sweeter flavor. A good rib rub such as this one. 1. 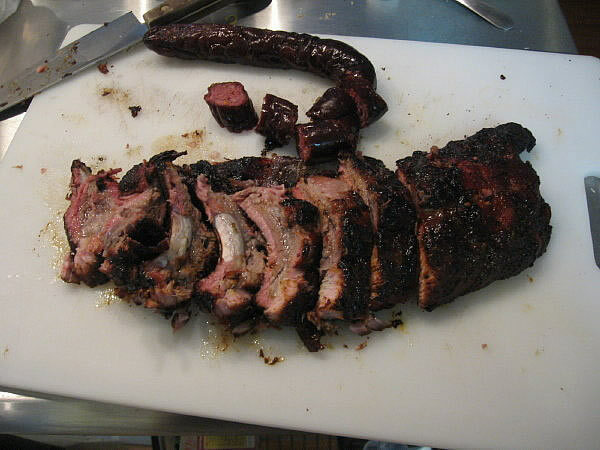 Choose a good cut of baby back ribs from your local meat market. Your butcher can be of great help when choosing them. The fat will most likely be trimmed away. I try to purchase ribs that have not been frozen because I like my ribs fresh. Sometimes you have to work with what you can get, so a previously frozen rack of ribs will do. For this baby back rib recipe, I used previously frozen ribs. 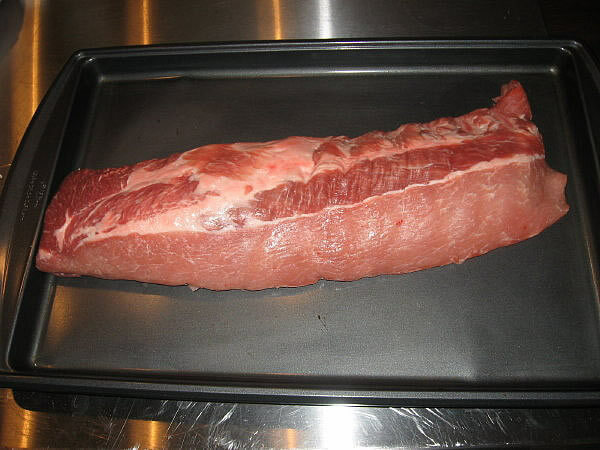 If there is fat on the ribs, trim the fat so that you have a very thin layer - 1/8 to 1/4 inch or so. 2. Trim the membrane off of the ribs. I use an extremely sharp paring knife to cut one end of the membrane loose. When I have a large enough flap that is peeled away from the ribs, I grab the membrane with my thumb and index finger and slowly pull the membrane from the ribs. You can grab it with a paper towel if you need extra grip. You may have to cut along the area where the membrane attaches to the ribs as you pull. Trimming the membrane definitely helps and your ribs will be much more tender if you do. 3. Rub the ribs down with a good layer of olive oil before you apply the BBQ rub. This will help the rub stick to the ribs. 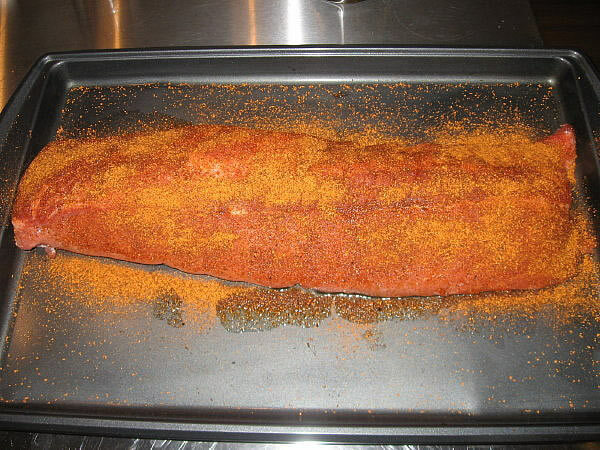 Apply the rub to the baby back ribs the night before you are going to smoke them. I like to let the barbecue rub work overnight. 4. I usually take the ribs out of the refrigerator about 30 minutes before I fire up the smoker. 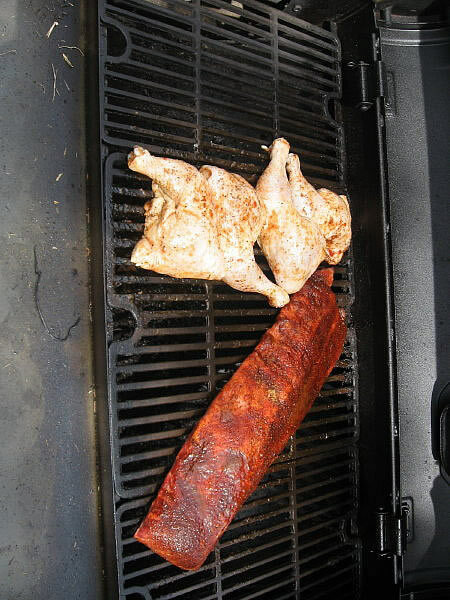 I like to let the temperature of the baby back ribs get closer to room temperature before I put them on the pit. 5. Heat up the smoker to 225 degrees F or so. I try to maintain 225 degrees F during the entire smoking process. 6. Place the rack of ribs on the smoker and let the smoker do it's thing. I smoke the baby back ribs for 3.5 hours.. They come out pretty tender that way. Another option is you can wrap the ribs in foil for the last hour. This will produce a different effect, and still create a very tender rack of ribs. You do not have to wrap the ribs in foil at all, and you should experiment to see which method works the best. 7. During the smoking process, I make a mixture of 3/4 apple cider vinegar, and 1/4 olive oil in a spray bottle, spraying the ribs every 30 minutes or so. Shake the bottle before you spray to mix the oil and vinegar. Spray the ribs before you wrap them in foil. 8. When the ribs are done, slice them between each bone and serve. You won't get any complaints in the rib department following the simple steps outlined above. The ribs I smoked were extra tender and fell apart. I could still slice them and keep each rib whole, but it was a little tough. When you wrap ribs in foil, they tenderize quickly but keep moist.